shortly after 15:00 BST today. A man has been stabbed in Wolverhampton. 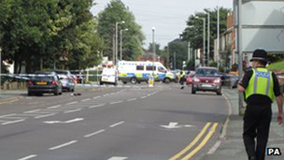 Officers said the attack happened in Parkfield Road, Parkfields, at around 15:00 BST. The 29-year-old victim has been taken to hospital with "non life-threatening" injuries, police said. The scene has been cordoned of and Parkfield Road is closed in one direction between Parkfield Crescent and Birmingham New Road. No arrests have been made so far, officers added.